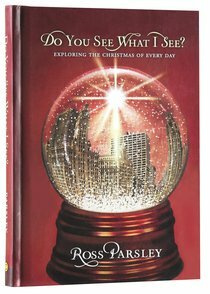 In this honest, warmly humorous exploration of the Nativity story, Ross Parsley shows how God uses ordinary people to fulfil His plan and purpose. Parsley doesn't avoid the dashed hopes and heartaches that happen along the way, but affirms that faith wins out in the end! About "Do You See What I See?" If a poll were taken of Old Testament Jews on the birth of their Lord and Savior, what percentage do you think would have predicted that the cast of characters would be a virgin teenager betrothed to a lowly carpenter, barnyard animals, and stinky shepherds? Probably not many. In Do You See What I See? Pastor Ross Parsley shows how God uses ordinary people to fulfill His plan and purpose. He gives a warm, humourous, and uniquely honest look into the nativity story. Along the way he highlights how God's favor and plans are often followed by dashed hopes, heartache, and disappointment, but he shows that if we're faithful with what God puts in front of us, we can accomplish the extraordinary. Pastor Parsley shows how God uses ordinary people to fulfill His plan and purpose. He offers a warm, humorous, and uniquely honest look into the nativity story, highlighting how God's favor and plans are often followed by dashed hopes, heartache, and disappointment. Customer Reviews For "Do You See What I See?" A nice short read that tells the Christmas story with a focus on just how ordinary the people God used are!!! In a story that is well-known I was challenged to see the characters in a new light and to realise that I'm not all that different to them, and God can be using me as part of His story as well. Tempted to buy numerous copies to give away to friends next Christmas!! !